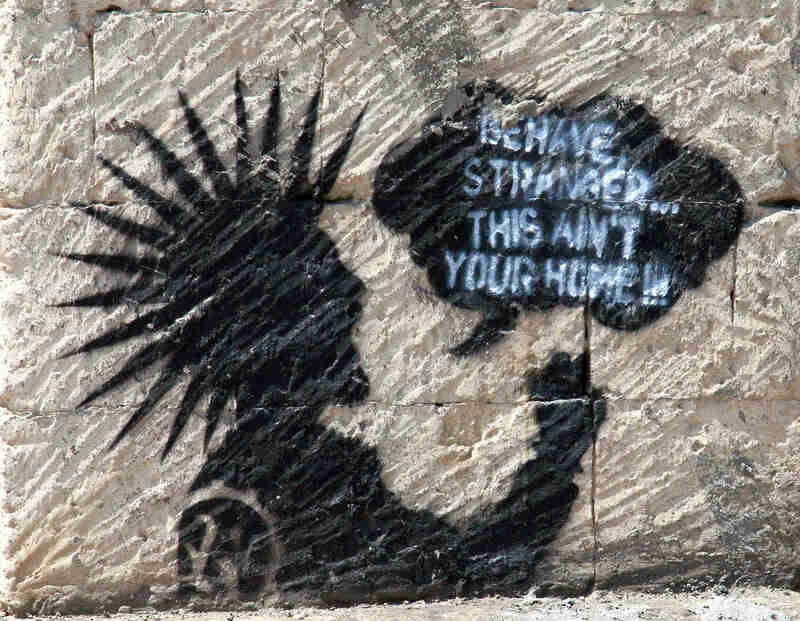 “Behave, stranger, this ain’t your home!” cautions a graffito on Jalan Legian, the clotted main artery of Bali’s Kuta-Legian-Seminyak beach strip. The advice comes decades too late. Ever since the late-1930s when a bizarre Englishwoman, known variously as Manx, K’tut Tantri and Surabaya Sue, built the first bamboo and thatch hotel here, Kuta’s grand sweep of shoreline has been a magnet for all sorts of strangers and misbehavers. Coconut groves, wayang kulit shadow puppets, morning roosters, midnight dogs, trance dancers and gamelan music – all these were common in Kuta until the late 1980s but are now mostly gone. The change was inevitable as the leisured classes of the world blew in, turned-on and stayed, seduced by Bali’s mix of exotica and art, endless surf and – let’s be frank – third-world labour costs. 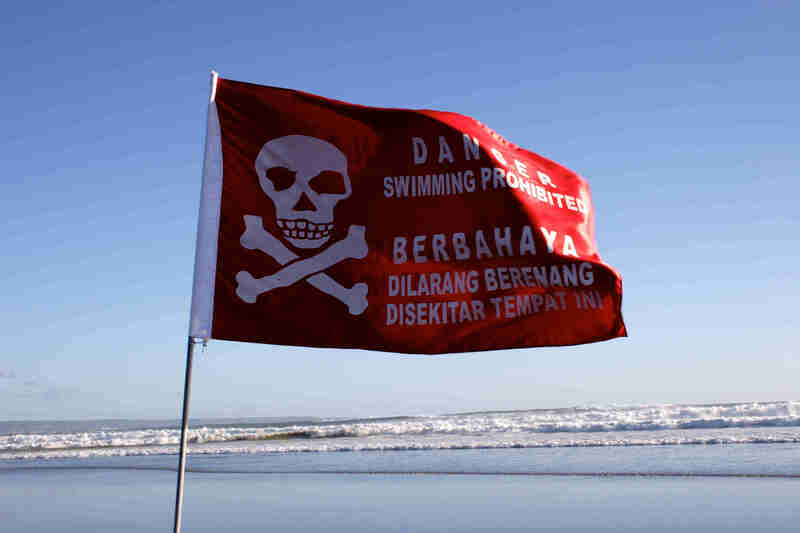 With around six million annual visitors – three million of them foreigners – parts of Bali are now choking on their own excessive success. Kuta, as Indonesians joke, is now an acronym for “Kampung Untuk Turis Australi” – Village For Australian Tourists. Kuta culture, in the form of resorts, hawkers, bars, surf schools, motorbike jams and transport touts, has spread for kilometres along Bali’s south-west coast. Construction cranes and new resorts jut above the treetops all the way to Canggu – aka “Cang-gone”. The island formerly known as “of the gods” boasts (though that’s hardly the word) a welter of alarming statistics. Bali’s governor Made Mangku Pastika predicted five million annual foreign visitors by 2015. That’s on top of an ever-burgeoning resident population of around four million. To stay mobile they need motorbikes – adding to the tsunami of existing vehicles, some one hundred new bikes are registered every day. The good news is that southern Bali can be a tale of two (or more) coasts, if you want. I take my leave of Kuta and head north-east to Gianyar regency. At Keramas, half an hour north of Sanur, we turn towards the sea, down a track that skirts brilliant green rice fields and the first holiday villas that, as elsewhere in Bali, will eventually engulf those fields. If the west coast seems like Paradise Googled, then this shore might be Paradise Recouped. Keramas looks east across black volcanic sands and all-day reef surf. This is still a coast of Hindu temples and flower offerings along the shore. Villagers crouch for hours, picking tiny black pebbles from the beach to sell for garden decorations. Others sit with legs buried in the hot, dark sands to ward off arthritis. There are no beach hawkers. 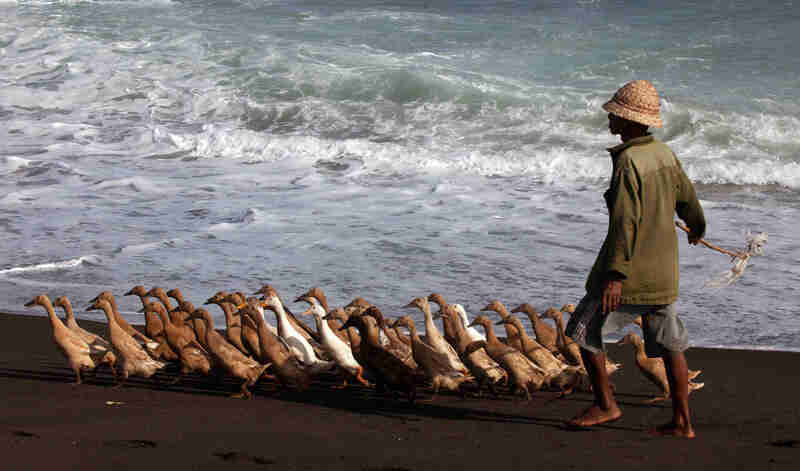 Instead, I see a farmer herding his fleet of 20 ducks along the sands. They rush on in a fluffy phalanx – stand in their way and it might be like being trampled by a herd of feather dusters. I’m staying at a new resort called Komune. Despite the name, this eco-savvy property isn’t a refuge for old ponytails and post-socialist hipsters. The clientele is mainly twenties-thirties surfing couples, here for the cranking right-hand reef wave that breaks immediately out front. The morning of the earth here smells just like Bali mornings used to – clove cigarettes, salt spray, last night’s rain, a whiff of temple incense. A sacred volcano hangs above the landscape like a sentinel, its conical tonsure right there – and then, with a shift of clouds, suddenly gone. The day passes in a welter of great waves, although with increasing crowds in the break. Time for nasi goring or eggs benedict from the beachfront restaurant. Much later, sunset’s soundtrack is a toccata of 10,000 cicadas plus the sea’s thumping bass-line, even if it is trashed by the doof-rap-techno slam of the resort’s sound system. “Keramas locals don’t want to see their place end-up like Kuta,” says Australian Phoebe Clarke, manager of nearby Moonlight Villa. Their wish to see their kids in local employment is reflected in the make-up of Komune’s bright young staff, drawn from surrounding villages. The resort owners, including former pro surfer Luke Egan, are focused on responsible eco-practice via their world-class wastewater and garbage systems, solar power and vegetable gardens. After a week of good waves, beach hikes, scrumptious gado-gado and the leisure to read two thick novels, it’s time for me to head back to the ‘Yak – Seminyak. Here, from a rooftop bar, I have a dress circle view of the cocktail sunset and all who dream or pose beneath it. Each time I come to this coast, I like it less – and yet still love it. This contrarily glorious strand is like Heaven’s Zoo, a Fellini-esque promenade of wanderers, poodle walkers, New Age remittance dudes, joggers, gigolos and tattoo tragics, all dressed or undressed in every fashion from hijab to dental floss. When darkness falls on the ‘Yak, diners on beanbags spill across the sands. Flood lamps and amps crank up, and the Bali Marley in front of one restaurant is soon out-shouting the Santana of Seminyak who are playing next door. The irony that K’tut Tantri named that first hotel just down the beach Suara Segara – the Sound of the Sea – might be lost on them. The ‘Yak booms on, regardless, a day-night mosh of beach hawkers and bling boutiques, nail spas, gay bars and proliferating resort and condo projects. If my trip has been a tale of two coasts, my conclusions are similarly polarized. 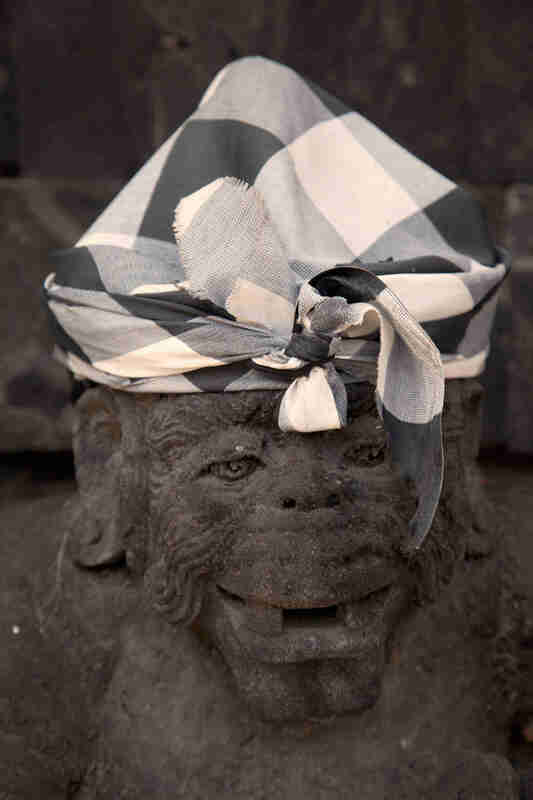 After all, Bali is the land of saput poleng, that symbolic, checkerboard-pattern cloth you see draped on statues everywhere, signifying that in local Hindu cosmology, the surface world can be simultaneously black and white, shadow and light. An early, long-term Bali resident, the late Australian painter Donald Friend, foresaw the juggernaut of international tourism coming to Bali and he didn’t much like the prospect. Back in 1970 he picked that a visiting team of international advisors and bankers were there on a mission to “convert villages, forests and mountains into vast, profitable jukebox alleys.” He was right on the money – and so were the bankers, literally. Today, another long-term Australian expat, Bali cultural commentator and landscape designer, Made Wijaya, aka Michael White, views Bali’s “development” far less critically: “The Balinese have a wholesome, no-nonsense attitude towards Nature: worship it, emulate it, but don’t let it get in the way of progress.” And thus we have the Balis of both Kuta and Keramas, of black and white, shadow and light. ©2014 John Borthwick. May not be copied or republished in any form without permission.